We make it easy for you to personalize an array of bath and body care products with your favorite scent. Hair Care, Body Lotions & Moisturizers, Massage Lotions & Oils and more can be custom-blended with this cherished fragrance. Enjoy a variety of possibilities with bespoke spa-quality products infused with your favorite fragrance, leaving a refreshing aromatic essence after you shampoo, bathe, massage, moisturize and hydrate! We are pleased to offer a variety of possibilities with our quality product line. As a perfume, we offer this timeless scent in six convenient sizes. 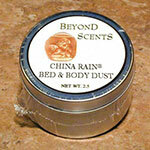 Your Original China Rain® fragrance comes with a 100% satisfaction guarantee. Select your China Rain® Products and Perfumes below. 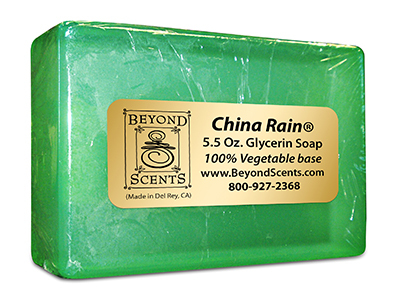 We purchase our China Rain® perfume oil directly from the original creator. China Rain® is a registered trademark jointly owned by A.K.A. Saunders, Inc., 2700 Rydin Road, Unit D, Richmond, CA 94804 and Body Time®, 707B Heinz Ave, Berkeley, CA, 94710.